At TigerPlace, we are committed to improving the lives of older adults in Columbia, Missouri, and across the world. We believe in a Registered Nurse (RN)/Social Work (SW) Care Coordination model that uses technology to promote early illness recognition and fall detection. Our model facilitates the use of nursing services and resources to assist older adults in maintaining their independence and be as active as possible, through the end of their life. Sharing our innovative model of RN care coordination will help other organizations benefit from what we have learned and help them implement similar systems of health care and personal services. Our TigerPlace Care Coordination model adds nearly another year to the length of stay (2.6 years) as compared to the national median of 1.8 years in residential senior housing. Adding the environmentally embedded sensor technology developed by researchers at the University of Missouri at TigerPlace increases the average length of stay an additional 1.7 years (4.3 years total). We have created the TigerPlace AIP Institute to share our innovations and facilitate the many requests we have for tours, education, and information on replicating this specific model. Although different environments and organizations will contribute to variances in programming, we believe that the core principles of our care model can be successfully applied across the continuum of care. Those interested in learning about the TigerPlace AIP model of care coordination receive the most benefit from visiting our community in person. Reviewing manuscripts included in the reference section prior to visiting TigerPlace will supplement and enhance the AIP Institute experience. Facility owners, administrators, healthcare providers, including care coordinators interested in innovative ways to improve effectiveness in the effectiveness of programs offered by their organizations. Researchers are likely to find this content beneficial as well. An overview of care coordination processes and methods that participants may wish to consider adopting and/or using to modify their organization’s care coordination model. Emphasis will be placed on the ways in which the embedded sensor technology, initially developed at TigerPlace and offered by Foresite Healthcare commercially, can support proactive intervention in a preventative, person-centered model. We will take an in-depth look at actual case studies that demonstrate the power of early intervention as a means of preventing avoidable deterioration in health status or adverse events, with particular attention paid to the use of this technology aided model to manage residents whose safety may be enhanced and cognitive decline slowed by appropriate interventions. A research-oriented day with details on how the algorithms were created for the Foresite technology and in-depth examination of Aging in Place and Care Coordination models. Dr. Rantz will be present on Day 2. Full Aging in Place policy and procedure manual, staffing model, example contracts, and legislative wording/changes $5,000. Full Care Coordination model, decision trees, consulting for implementation, and all long-term care exceptions (with exact wording) $5,000. Foresite has commercialized the sensor technology we use at TigerPlace for early alerts. Costs of adding the technology to your facility would be negotiated with this team. You can fly in and out of: St. Louis Lambert International Airport, Columbia Regional Airport, or Kansas City International Airport. You are responsible for providing your own transportation to and from TigerPlace for the Institute. Welcome letter and special rate!! Tours of TigerPlace are conducted on the 1st Wednesday of each month beginning at 10:00am. E-mail info@agingmo.com to schedule a tour. Below are a few of the articles which have been published about Aging in Place and TigerPlace. You may want to read a few of the articles before registering for the Institute. 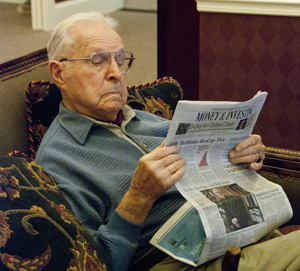 A complete list of articles published by the Eldertech team may be found at www.eldertech.missouri.edu/papers/. Rantz, M., Popejoy, Lori L., Galambos, C., Phillips, L.J., Lane, K.R., Marek, K.D., Hicks, L., Musterman, K., Back, J., Miller, S.J., & Ge, B. (2014). The continued success of registered nurse care coordination in a state evaluation of Aging in Place in senior housing. Nursing Outlook, 62(4), 237-246. Rantz, M.J., Skubic, M., Miller, S.J., Galambos, C., Alexander, G., Keller, J., & Popescu, M. (2013). Sensor technology to support Aging in Place. Journal of the American Medical Directors Association, 14(6), 386-391. PMCID: PMC3683379. Marek, K.D., Stetzer, F., Adams, S.J., Popejoy, L., & Rantz, M. (2012). Aging in Place versus nursing home care: comparison of costs to Medicare and Medicaid. Research in Gerontological Nursing, 5(2), 123-129. PMID: 21846081. Rantz, M.J., Phillips, L., Aud, M., Marek, K.D., Hicks, L.L., Zaniletti, I., & Miller, S.J. (2011). Evaluation of aging in place model with home care services and registered nurse care coordination in senior housing. Nursing Outlook, 59(1), 37-46. PMID: 21256361. Marek, K.D., Adams, S.J., Stetzer, F., Popejoy, L., Petroski, G.F., & Rantz, M. (2010). The relationship of community-based nurse care coordination to costs in the Medicare and Medicaid programs. Research in Nursing & Health, 33, 235-242. PMCID: PMC3046776. Rantz MJ, Skubic M, Miller SJ & Krampe J, “Using Technology to Enhance Aging in Place,” Proceedings, International Conference on Smart Home and Health Telematics, Ames, Iowa, June 2008, pp 169-176. Johnson, R.A., Rantz, M.J., McKenney, C.A., & Cline, K.M.C. (2008). TigerPlace: training veterinarians about animal companionship for the elderly. Journal of Veterinary Medical Education, 35(4), 511-513. PMID: 19228901. Rantz, M.J., Porter, R., Cheshier, D., Otto, D., Servey, C.H., Johnson, R.A., Skubic, M., Tyrer, H., He, Z., Demiris, G., Lee, J., Alexander, G., & Taylor, G. (2008). TigerPlace, a state-academic-private project to revolutionize traditional long-term care. Journal of Housing for the Elderly, 22(1/2), 66-85. PMCID: PMC3091822. Marek, K.D., Popejoy, L., Petroski, G. & Rantz, M.J.(2006) Nurse Care Coordination in Community-Based Long-Term Care. Journal of Nursing Scholarship, 38(1), 80-86. Rantz, M.J., Marek, K.D., Aud, M.A., Johnson, R.A., Otto, D. & Porter. R. (2005) TigerPlace: A New Future for Older Adults. Journal of Nursing Care Quality, 20(1), 1-4. Marek, K., Popejoy, L., Petroski G, Mehr, D., Rantz M.J. & Lin, W. Clinical Outcomes of Aging in Place. (2005) Nursing Research, 54(3), 202-211. Marek, K.D., Rantz, M.J., & Porter, R.T. (2004) Senior Care: Making a Difference in Long-Term Care of Older Adults. Journal of Nursing Education, 43(2), 81-83.